Learn how to make no bake s’mores bars at home! This simple recipe calls for 4 ingredients and takes under 15 minutes to come together. This summer dessert recipe is so yummy and easy you’ll want to make it every week. No one knows for sure who invented the s’more. However, the first published recipe for “some mores” was in a 1927 publication called Tramping and Trailing with the Girl Scouts. Loretta Scott Crew, who made them for Girl Scouts by the campfire, is given credit for the recipe. There isn’t a flavor combo I crave more in the summertime than a delicious s’mores recipe! It reminds me of gathering around the fire, listening to music with friends and roasting marshmallows while lightening bugs dance around and the stars twinkle above. It’s one of those recipes that sparks joy in my heart and sends me back to memories as a kid and some of the best times I’ve spent with family and friends. Once I ate 5 s’mores in one sitting when I was like 13. That’s how much I love them. Who know three simple ingredients could make such a major impact. This is why I love baking so much?. Another one of those for me is coffee cake because it reminds me so much of my grandma. Are there any recipes you can think of that take you back to your childhood or remember a specific memory?! In the summer I do my best to get outside and spend some time by the fire. With the rain we’ve been having it’s been kinda difficult to get the fire going and before I moved into my new house we didn’t have an area to roast marshmallows at all. When you don’t have a campfire to roast marshmallows for s’mores you have to get crafty to get that summertime s’more flavor combo. 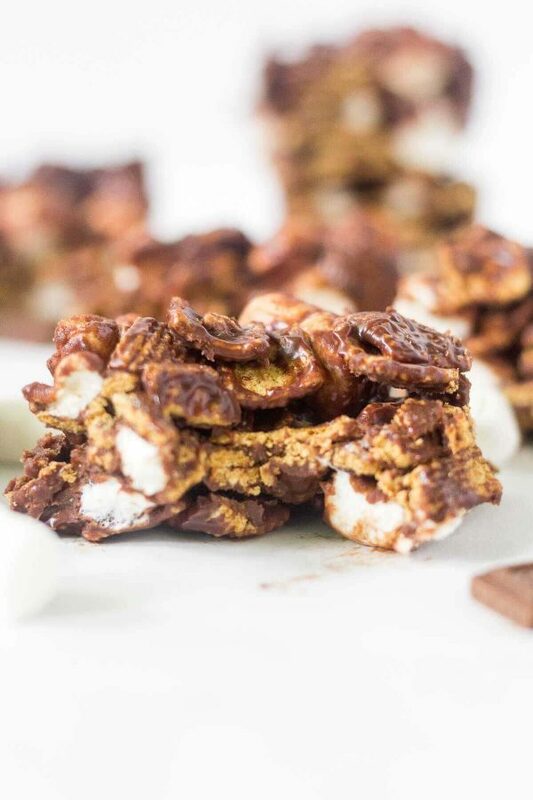 Hence the no bake s’mores bars! No baking or fire required for this easy dessert recipe. In fact, there are only 4 ingredients and under 15 minutes needed to get this recipe together. Simple and tasty is how I roll. 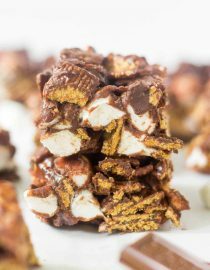 Golden grahams are the base of this recipe and act as the graham crackers in a traditional s’more. 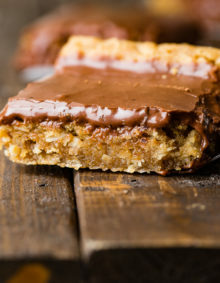 They sweet and crunchy and create all the structure for these no bake s’mores bars. Marshmallows are a must when it comes to s’mores. These marshmallows get doused in chocolate (yum!) and mixed with the graham crackers. 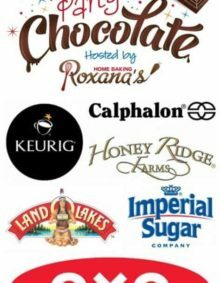 Milk chocolate is another s’mores staple. I used Hershey’s in this recipe and melted them down to coat the other two ingredients. Heavy cream helps create a ganache and thickens up the chocolate to coat all of the ingredients. 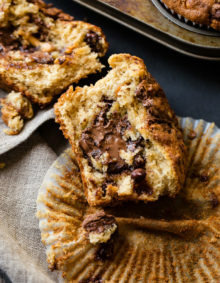 I love them because not only are these 4, delicious ingredients the star of the show but it also takes a matter of minutes for them to come together and turn into an epic dessert. Can S’mores Bars be Made Ahead of Time? No Bake S’mores Bars are the perfect “Make Ahead” treat! To make no bake s’mores bars, start by warming the heavy cream in the microwave for 1-2 minutes. The top will begin to bubble when it’s hot enough. 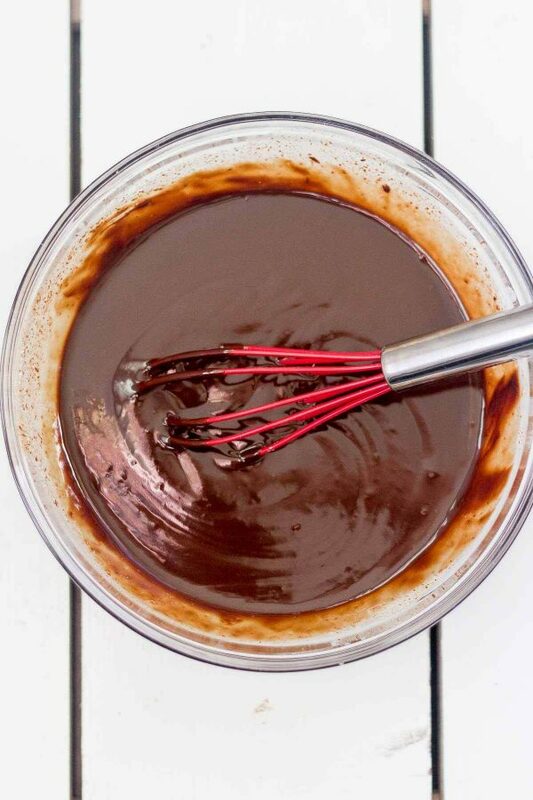 Add the milk chocolate to the cream and whisk thoroughly to create a thick ganache. 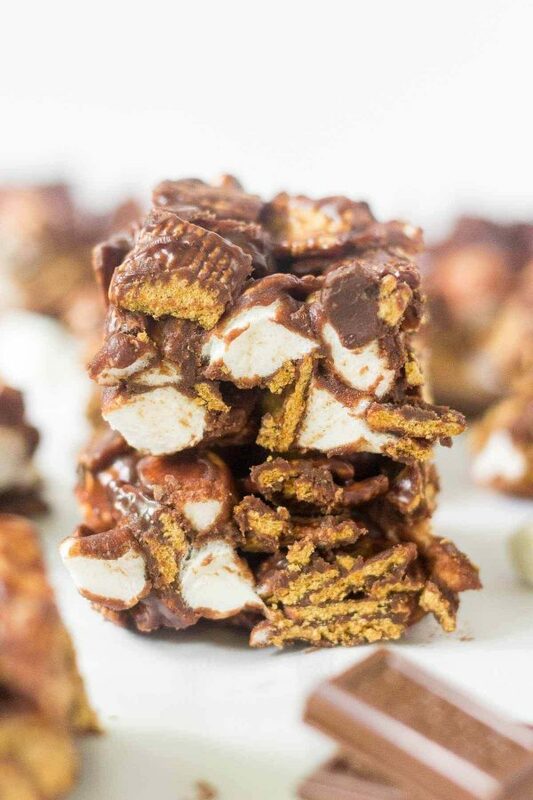 Pour the chocolate mixture over the golden grahams and marshmallows and coat completely. Press into an 8×8 in baking pan lined with foil and let set in the fridge for 2 hours. 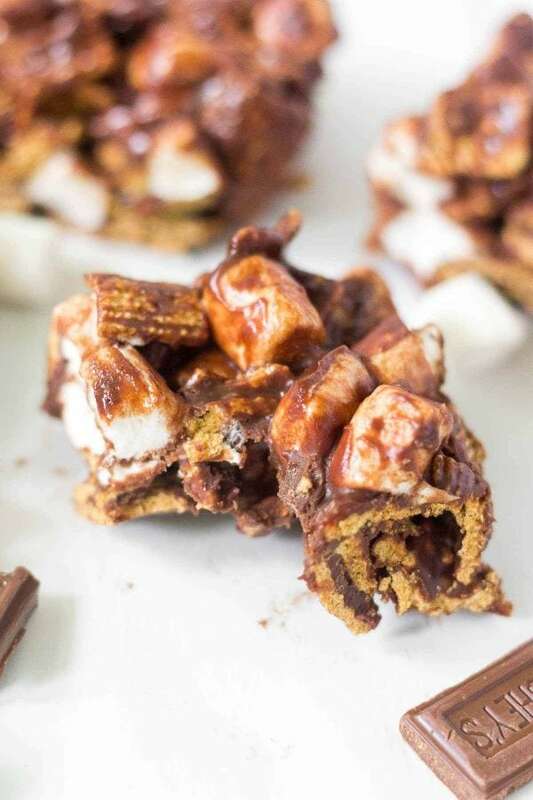 When you pull them out you’ll have thick, chewy and crunchy no bake s’mores bars to take to all your summer activities! Maybe even a soccer game or pool party?! 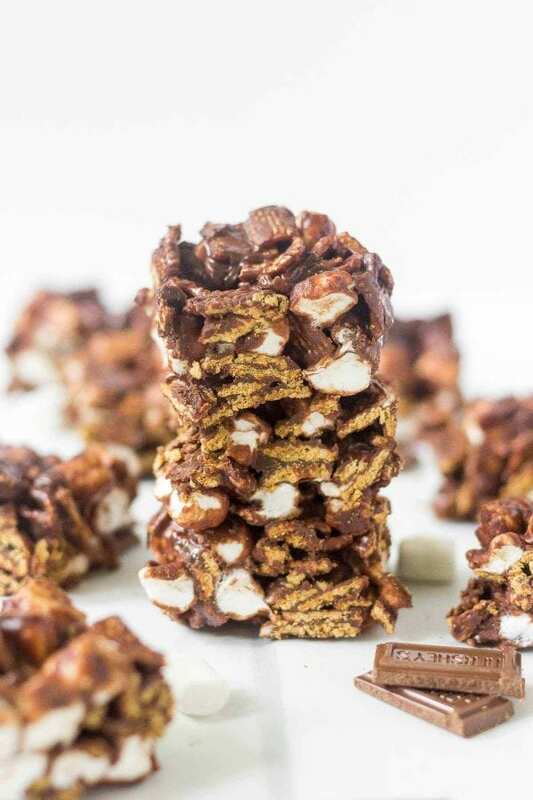 Not only are these easy no bake s’mores bars perfect for all the summer activities, but they’re also great to take to bake sales or stick in your kiddo’s lunch as they head back to school (are we talking back to school already!?). When easy and delicious come together, there’s really nothing better! Line a 8-inch-square baking pan with heavy-duty foil and set aside. In a large microwave safe bowl, add the heavy cream and heat on high in the microwave for 1-2 minutes, until it starts to bubble. Add the milk chocolate and whisk until smooth, about 1-2 minutes. Allow to cool, stirring occasionally, for 5-8 minutes. Spread mixture into prepared pan, pressing down lightly with a rubber spatula. 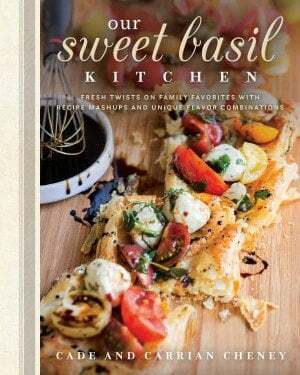 All images and text ©Molly Leonard for Oh Sweet Basil. Want more s’mores inspo? 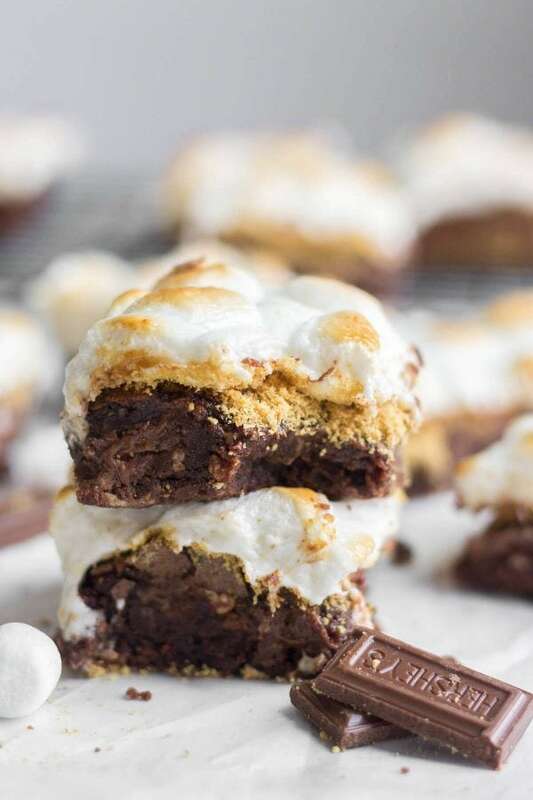 Try Our Best S’mores Brownies! 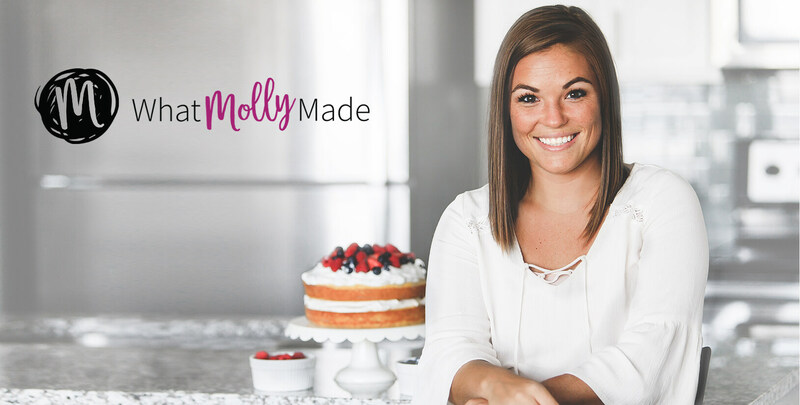 Still looking for a delicious no bake dessert? Try these classic no bake cookies!